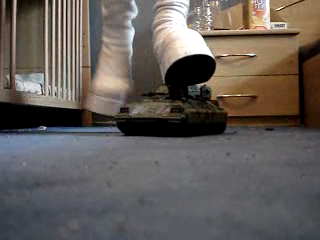 BuffaloLady crushes a toytank under her white buffalo plateau boots. She uses all her weight to grind the tank completely into the ground. Of course the little tank has no chance agains this gigantic attacker. Cindy told her little brother numerous times to clean up the room after playing in there – but of course he didn’t listen. So she decides to punish him by crushing one of his favorite toys – a big fire department truck. She takes it into a basement room and starts to crush it under her Buffalo shoes. The truck shows some resistance at first but she finally crushes it completely – just before she calls her brother to clean up the mess his toy made!